A stand builder fixes a logo at the Google stand at the CeBit 2010 exhibition, the world's biggest high-tech fair in Hanover, northern Germany. 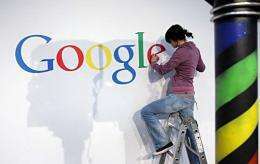 Internet giant Google announced Monday that it had bought Picnik.com, a website that allows users to edit and store photos online. Internet giant Google announced Monday that it had bought Picnik.com, a website that allows users to edit and store photos online. "Until recently, you had to edit your photos using client software on your computer," Brian Axe, a Google product management director, said in a blog post. "Today, we're excited to announce that Google has acquired Picnik, one of the first sites to bring photo editing to the cloud," Axe said. Axe said Google would not be "announcing any significant changes to Picnik today, though we'll be working hard on integration and new features." He said Google would "continue supporting all existing Picnik partners." Picnik allows users to import photos from other services such as Picasa, Flickr and Facebook. In a blog post announcing the purchase, Picnik said it had 20 employees and receives millions of visitors a month. "Under the Google roof we'll reach more people than ever before, impacting more lives and making more photos more awesome," Picnik said. "Google processes petabytes of data every day, and with their worldwide infrastructure and world-class team, it is truly the best home we could have found," Picnik said. Google's purchase of Picnik comes about three weeks after the Internet giant bought Aardvark, a "social search" service that relies on a user's contacts to provide answers to questions. Google chief executive Eric Schmidt said in a conference call with analysts in January that the Mountain View, California, company planned to acquire about one company a month this year.